G-TECH is the easiest, most effective way to measure the performance of your car before and after modifications. It's a dedicated-hardware device specificaly designed for vehicle-dynamics testing. There is nothing, and I mean nothing, that comes close to the same "bang for buck" when you want to know the truth about your car. Sure, you can go to the dyno or to the track. But not whenever you want to. Not to mention, everytime you go, you pay. 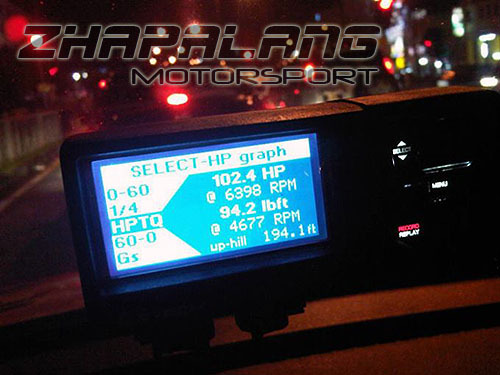 With this new High-Frequency GPS Technology the accuracy and the consistency is so superb that we encourage you to compare the results to your favorite track or dyno. If you are not blown away by how great it is, just send it back, no questions asked. High-Frequency (10Hz) GPS engine and antenna are built-in. This makes the new generation G-TECH/Pro much more user-friendly and it’s a lot easier to get accurate results. For example, you no longer have to do all your measurements from a stand-still. You could be driving along and decide to gun-it and it will automatically give you delivered Horsepower and torque for that run. Experience is the name of the game here. We have spent last 20 years on the race-tracks and drag strips, testing, tuning and comparing our equipment against other measurement methods. You could say that we are performance measurement fanatics. Hence, the name of this new G-TECH/Pro is FANATIC Precision Series. Rugged, durable design. G-TECH is made with an advanced polymer called Santoprene. It’s a rubberized material capable of withstanding severe vibrations and 350 degree (Fahrenheit) temperatures. As you know, it gets hot under the windshield in a summer day. Built tough, built to last. Fasteners are considered “stress raisers” so there are no screws anywhere in the G-TECH. All of the internal components are floating and secured inside Santoprene. Proven suction-cup mount is designed to generate increased vacuum capable of holding over 100lb. Immediate answers. You can “snap” the G-TECH in and out of the mounting cradle in a simple split-second action. This way you can have it in your hands when reviewing the runs. G-TECH is all about seeing the results right away while it’s all still fresh in your mind. This way you can relate the cars behaviour and the conditions to the actual results. High-Resolution Graphics LCD display is capable of displaying graphs in a similar resolution to a dyno-plot. The new-generation LCD technology has a super-high contrast and the colour of the backlight can be adjusted to match any cars lighting. Control Module deataches from main unit. You will find this convenient especially when strapped in a 5-point racing harness. Having it mounted on a shifter, for example, will allow you to control the unit without reaching for it. It uses a regular 8-pin Network (Ethernet, Cat-5) cable which is available in any electronics store. During normal driving you can display current speed, G-force or horsepower. The arrow shows the direction of G-forces. Yes, G-TECH is a super-accurate GPS speedo with fast update rate for your boat as well. Major results like 0-60mph, 1/8 & 1/4mile ETs, horsepower, braking distance etc. are automatically displayed in big easy-to-read numbers. You can display a graph for any of the measurements like this horsepower and torque vs rpm. It sure beats going to the dyno every time! And it's super-accurate! You can display of speed vs time will give you 0-60mph (0-100kmph) or increasingly popular 0-100mph time. You can even get passing times like 40-60mph, for example. 1 Year warranty on any manufacturing defects. SUPPLIED WITH: G-Tech Pro Fanatic Precision Series - SS Meter, Fanatic Precision Series Mounting System (Glass Suction), Cigarette Power Cord, Software CD and Manual.